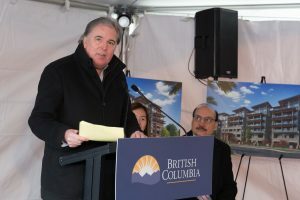 “We are very proud and honoured to be a part of these important affordable housing initiatives through a partnership with the Province of British Columbia, BC Housing and the City of Burnaby using our collective resources and expertise to meet the challenge of providing affordable, quality homes for those most in need.” – Ward McAllister, President and CEO of Ledingham McAllister Communities. Our special attendees getting together for a quick photo op with their shiny new shovels! In celebration of Ledingham McAllister’s commencement of a 91-unit seniors housing building, as well as the completion of a 90-unit family housing project, municipal and provincial members of the government, media representatives, and dignitaries attended a very special ceremony in the Edmonds neighbourhood of South Burnaby – one that will be remembered by all! 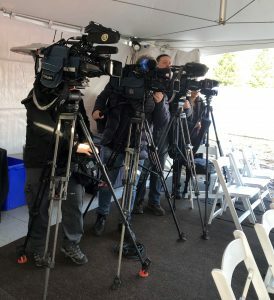 Some of the notable guests included Ward McAllister (CEO of Ledingham McAllister), Mike Hurley (City of Burnaby Mayor), Raj Chouhan (Burnaby-Edmonds MLA) and Anne Kang (Burnaby-Deer Lake MLA) and Paul McDonell (City of Burnaby Councillor). The amazing media turnout at our ceremony! 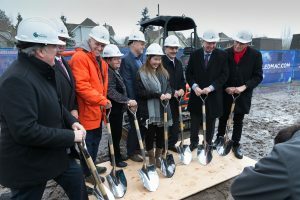 Braving the mud and the typical Vancouver rain, guests gathered around the building site of Ledingham McAllister’s 6-storey senior residence building to commemorate the start of construction as well as pay respect to our most valued members in society – our elders. This development, located adjacent to our new and upcoming Cedar Creek community, will provide high-quality homes to take care of those most deserving. 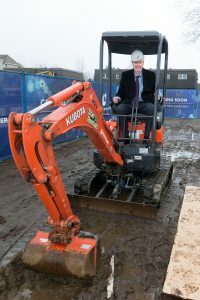 One of our guests, Paul McDonell, taking a turn breaking some ground! During this ceremony, guests and speakers recognized the increasing need for affordable housing in our city as well as acknowledged the efforts and collaboration between Ledingham McAllister, the Province of British Columbia and the City of Burnaby to meet this demand. Ward McAllister giving a speech at the groundbreaking ceremony. The fun didn’t stop there! At our ribbon-cutting ceremony, we celebrated the official opening of our family housing project, where 90 families living in an outdated community were relocated into brand new homes. 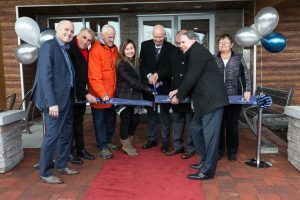 In partnership with the City of Burnaby and the Province of British Columbia, a conscious effort was made to keep this new development within the same neighbourhood, in order to prevent displacing residents. At Ledingham McAllister, we are devoted to the well-being of community residents and the neighbourhoods in which we are privileged to build. Officially celebrating the opening of our family housing development. To wrap up the event, Ward McAllister spoke about our highly-anticipated master-planned community in the area, Southgate City. In combination with our latest development, Cedar Creek, these communities are expected to build up the surrounding neighbourhoods, bringing life to the area and making it livable for all. 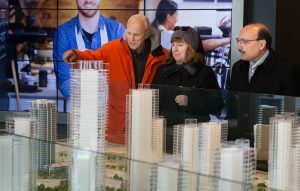 Guests taking a closer look at our Southgate City display model. We are proud to say that this event was a huge success! 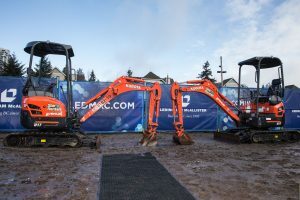 At Ledingham McAllister we are committed to giving back to the communities where we build and this day was an opportunity to celebrate our hard work as well as recognize and appreciate the surrounding neighbourhood and their residents.